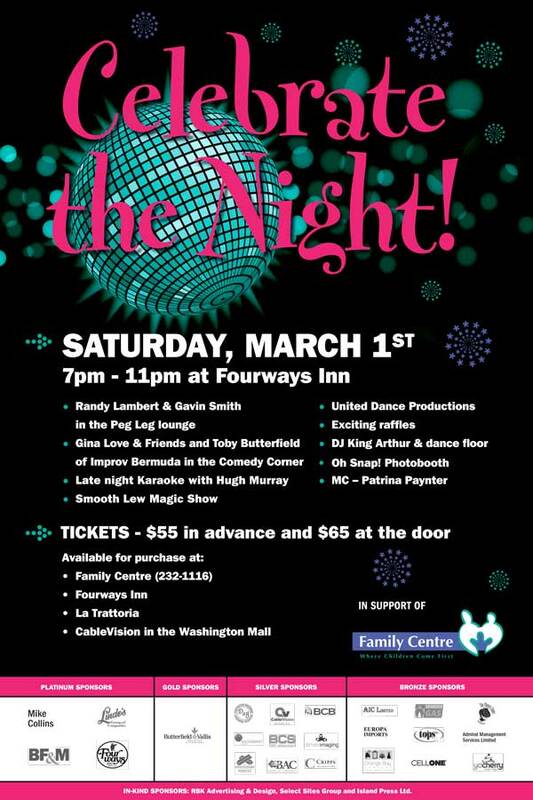 In support of Family Centre’s many positive community endeavors, the organization is getting set to host “Celebrate the Night”, an evening of fun set to take place on Saturday, March 1 from 7.00pm to 11.00pm at Fourways Inn. The event’s main attraction will be an appearance by Randy Lambert and Gavin Smith in the inn’s Peg Leg Lounge, with Gina Love and Friends and Toby Butterfield of Improv Bermuda set to hold down the Comedy Corner. Additional fun includes late night karaoke with Hugh Murray, the Smooth Lew Magic Show, an appearance by United Dance Productions, raffle draws, DJ King Arthur and an open dance floor, and an Oh! Snap photo booth, with Patrina Paynter set to play host of the party as MC. Tickets for “Celebrate the Night” are available for $55 in advance and $65 at the door. Tickets are currently available for purchase at Family Centre [232-1116], Fourways Inn, La Trattoria, and CableVision in the Washington Mall.